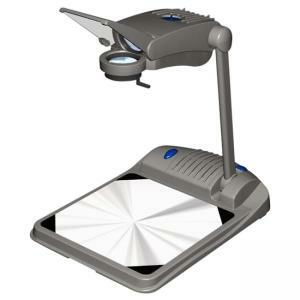 Apollo Ventura 4000 Portable Overhead Projector offers advanced styling, features and performance, plus ultra-portability at just 8 lb. The cutting edge, contemporary design delivers the big picture with style. Its more than 2,000 lumens of brightness are ideal for projecting most transparencies. The protective hardshell cover includes molded handle, fold-down arm and internal storage for power cord and transparencies. Three-element vari-focal lens gives a sharper focus and picture clarity. Lamp changer with two lamps prevents delays. Oversized stage allows projecting in landscape or portrait formats. Stage size is 11-1/4" x 11-1/4".